Julia and Valentina Poole are twenty-year-old mirror twins living in Chicago. What is a mirror twin? While the girls look nearly identical, Valentina is actually a mirror image of Julia, from the mundane (her hair parts on the opposite side) to the medically questionable (her heart is on the right side of her chest). Their personalities are opposites as well—Valentina is quiet and fearful, while Julia is bossy and bold—but the difference only amplifies the twins’ intense attachment to each other. They are still virgins, and their relationship with each other is codependency at its worst; they sleep together, they wear matching outfits, and they even have suitcases with cartoon faces to represent their childish nicknames. After trying three different colleges together, they’ve given up and moved back in with their parents. One day they receive word that their aunt Elspeth Noblin has died of cancer. Though they never knew her, she has bequeathed all of her effects to them, including an apartment bordering upon Highgate Cemetery. Elspeth merely insists that to receive the inheritance, the twins must live in the apartment for one year, and their parents may never enter it. Not a bad deal for a free apartment in London, and the twins aren’t doing much else with their lives. They agree to the terms. They soon find that the apartment building is inhabited by colorful, if odd, residents. At this moment he knew everything he would ever know of Elspeth, and he urgently needed to stop time so that nothing could escape. But it was too late; he should have stopped when she did; now he was running past her, losing her. She was already fading. However, the appearance of Valentina helps to dispel his cloud of mournfulness; the two begin dating very soon after the twins move in. But the most unusual character the twins encounter is Elspeth herself. However, rather than haunting them in any real sort of way—or, really, doing anything of interest—Elspeth prefers to spend most of her time curled up in a drawer or floating mistily around the apartment. The stray kitten that the twins befriend is one of the most exciting parts of the novel (which should tell you something), but it dies suddenly when Elspeth pulls its soul from its body—a clumsy piece of foreshadowing. The alarming dependence the two girls have on each other must come to a head, and it does, with a stunning (though foreseeable) climax: Valentina asks Elspeth to kill her. Temporarily, of course! Valentina believes that only by faking her death will she attain the freedom from Julia that she so craves. But Valentina gets a little more freedom than she had planned. Once her spirit was free from her body, Elspeth later says, it was impossible to force it back in; Valentina didn’t know how to be a good little ghost yet. Elspeth sees her opportunity, and enters the body herself. Valentina is left a lonely spirit; not even Julia can see her yet. So she hitch-hikes on the back of a bird, and flies off into the horizon. I liked the mystical sense of foreboding that the cover of the hardback imparts. But that’s where my enjoyment of this book ended. The theme of symmetry, of identical identity, is the prevalent theme of the book. The relationships between the twins, their aunt and mother (who were also twins), and their neighbors take center stage. The twins (both Elspeth/Edie and Valentina/Julia) are painfully dependent on each other, and many times their identities meld. But other strange couplings take places as well. Edie and Jack have as complicated a relationship as Elspeth and Jack. Elspeth and Robert date until her death, whereupon Valentina and Robert meet and begin dating. Julia takes a liking to Martin, but at his refusal (he seems to be the only sane one in the book), Julia opts for his son, Theo, instead. Julia even comments that when she looks at Theo and sees Martin, it must be what it was like for someone to look at Valentina and see Julia. These complicated and unrealistic bonds overextend the symmetry theme, and they are a little too sexualized; even the twins’ relationship has a large dose of sexual tension. Furthermore, I was taken aback by the flourishing relationship between Robert and Valentina. Does Robert not realize he is dating the daughter of his former lover? And she looks and acts like a child! Both twins are like rabbits—timid, all in white—and Valentina especially is afraid of such simple adventures as crossing the street. Robert’s attention to her seems completely unhealthy, with rather clear pedophilic and incestuous undertones. It is immediately obvious that when Valentina decides to die, Elspeth will take over her body. But I didn’t really care; Valentina is so thoughtless when it comes to planning her death, with no thought to the grief and pain she will cause, that my last shred of interest in her was destroyed. If the book had closed when Robert realizes Elspeth now occupies Valentina’s body, it would have been more powerful, if in a creepy and suspenseful way. At least the reader would be forced to use his or her imagination. Instead, the ending is anticlimactic; it piddles off into mediocrity. But I wasn’t that surprised; the events leading up to the climax weren’t that interesting either. I found some of the extremes of the characters’ disposition, such as the fragility of Valentina’s health, incredible; she has deadly asthma, yet her sister and father smoke regularly? Valentina and Julia have a very codependent relationship, yes, but does Valentina really have to fake her death to escape? Whatever happened to the good ol’ days of leaving quietly in the night? I questioned whether this story was supposed to be believable at all. While Niffenegger’s first book, The Time Traveler’s Wife, has indisputable roots in science fiction, this book defies genre—and not in a good way. It is not quite magical realism, not quite fantasy, no traces of horror or thriller, and certainly not realistic. In short, not much of anything. Niffenegger’s prose is reasonably articulate but by no means stunning, or even excellent. I would highly recommend against anyone reading this book. Please, don’t waste your time. Thanks for this honest review. I loved TTTW, but got this one as a review copy, and I have to say, it just doesn’t appeal to me. I read a bunch of reviews when it came out and people seemed to like it. But I am glad to hear you say not to waste my time, bc I was feeling guilty for not picking it up. Glad I could help! I know that feeling of guilt well, but I think your time would be much better spent on something else! 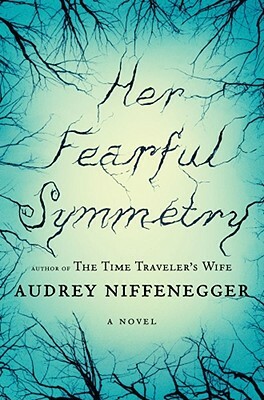 I read Her Fearful Symmetry when I censored books in my school library. Although this book is unsuitable for my students (I teach 7th grade) and I forbid the librarian to put it on any bookshelf, I found the book quite interesting for adult. This book has some compelling theme such as death, authenticity, freedom, alienation, and the absence of God.